It’s that time of year again, everyone — FREE COMIC BOOK DAY! What’s Free Comic Book Day? Well, this year it’s May 6th. But that’s just the date. Free Comic Book Day is, in their own words “a single day when participating comic book specialty shops across North America and around the world give away comic books absolutely free to anyone who comes into their shops.” At Slackers, we LOVE Free Comic Book Day, and want you to come join in the celebration with us. We’ll have special deals, costumed superheroes, free food, and of course, FREE COMICS! 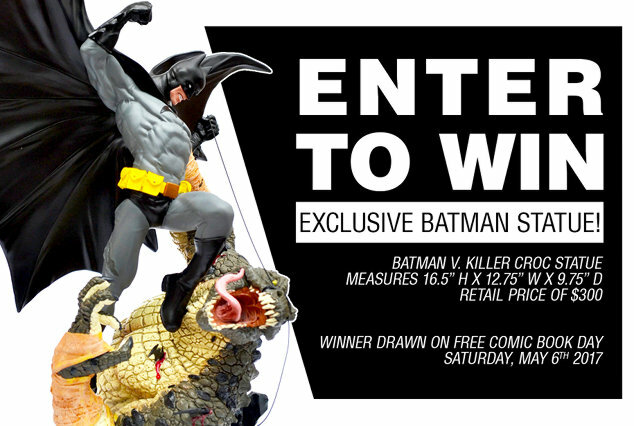 We’re giving away an exclusive 16.5" Batman statue! This awesome statue retails for $300, but you could get it for free! Visit any slackers location between now and Free Comic Book Day and enter to win. We’ll be drawing a winner at random from all the entries on Free Comic Book Day. If the free comics aren’t enough for you, take advantage of some sweet deals we’ll be offering all day long*! * Availability will vary by location. Not all locations will have all titles. Some exclusions apply. Sales replace regular Power Card Member offers where applicable and cannot be combined with any other offer. Not valid with trade. Selection varies by location. Some items may be subject to limited availability and/or manager discretion. No dealers.